Hello lovelies!! 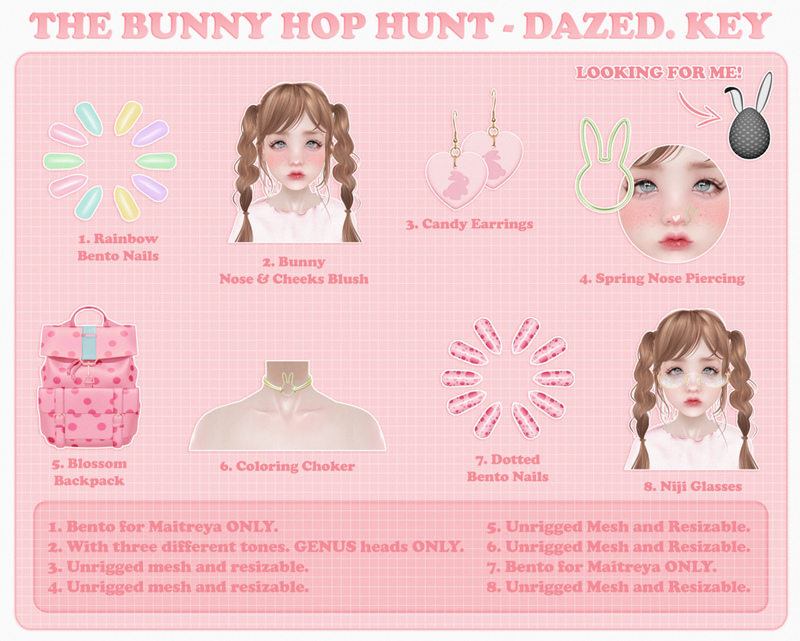 The next April 20 starts a new round at Harajuku event, here my new and exclusive release for this round: "Chiharu Mesh Ears" are unrigged mesh and reszable, in customization hud includes twelve skin tones and the same twelve tones but with red blush, eight different colors for bows and eighteen metals for earrings. You also have the RGB tint hud to play with the skin tone. Hope you like and happy shopping! Hello sweeties!! Today April 17th, starts a new round of Tres Chic Event, and DAZED. for first time is part of designers team!! I'm super excited with this!! Here my new and exclusive release for the round: "Cute Little Horns" are 100% unrigged mesh and resizable, comes with a customization hud with eight different colors of horns and six different skin tones (NO SKIN option includes too). Hope you like and happy event!! Hello girls! The next March 26 starts Spring Flair 2 by Flair for Events, and DAZED. is part of the team of designers!! Here my new and exclusives items for the event: "Bani Makeup Set" are for genus and catwa mesh heads, you have three different colors, these makeup have better results in pale skins. "Hoshimi Lips Set" are for genus and catwa mesh heads, you have twelve different tones of lips, these lipstick have better results in pale skins too. And finally " Jun and Yuu Nose Earrings", are unrigged mesh and resizable, you have four different metals to choose (sold separately): Onyx, silver, gold and bronze. About nose earrings, if you are interested in the fatpack, in it you will find a customization hud with all the metals mentioned above plus other metals. Hope you like all anf happy events! !